What If Your Training Neglects An Area Of Physical Violence?? What if your training neglects an area of physical violence? Let us say you train in a system that specializes in one specific area say….. striking or grappling or weapons, kicking, etc. So if you were training in a system that is excellent on striking but does not cover weapons/tools, trapping and locking and grappling. You are proficient in hand strikes and kicking, maybe knees and elbows but not really anything else. If you have been doing it for a while and you are really good at it then in that area of combat you probably have a good chance of defending yourself. But what if your opponent decides to take you to the ground and gets you there? What do you do? 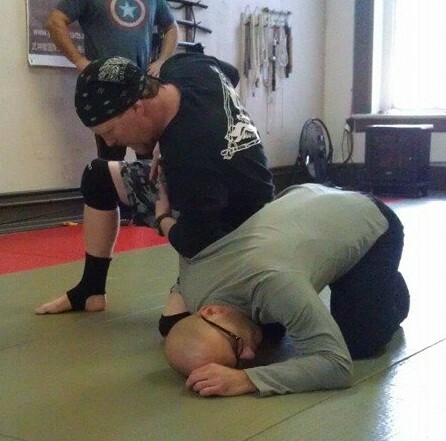 If you haven’t trained on the ground in a grappling method you may quickly find that your skill sets are useless or you are unable to defend yourself. The same “what if” in that you are a great striker but you encounter someone with a knife or a gun and they not only plan on robbing you but also killing you and possibly your family. You may find yet again that your skill sets do not translate very well unless maybe you get lucky. The same could be said about the guy who only trains with a handgun and never practices any empty hand defensive tactics or the guy who is studying Brazilian Jiujitsu but never works with weapons/tools or strikes. Bottom line in a physically violent encounter if someone takes you to an area you are not familiar with then you could be potentially in a world of hurt. When I designed IRT I had an overall goal in mind. That was if an IRT practitioner was in a moment of violence they would have fundamental skill sets that would allow them to be effective in any area of combat whether it was with weapons/tools, kicking, hand strikes, trapping hands or joint manipulation and of course grappling. I wanted for myself and anyone that trained with me to be effective in all of those areas. If someone took them down and started to ground and pound them I wanted for them to have an answer and if possible to be able to take it to an area of their choosing when appropriate. Then I want them to specialize in areas that are to their liking. You simply cannot be the best at everything but nothing says you cannot have decent to good skills in all areas of violence. Plus be a specialist of extreme skill in a few areas. To neglect any area of physical violence places holes in your training that an enemy can exploit. We humans are really good at exploiting our opponents weaknesses. Some times we plan it out and some times we recognize it in a quarter of a second. My advice on your martial journey is to make sure you are proficient in any area that physical violence can happen in. If you do this then in a moment of violence you should have a chance regardless of what kind of violence comes your way. That “chance” is all we can ask for! This entry was posted in martial arts, self defense, personal protection, instin and tagged Brazilian Jiujitsu, Brian R. VanCise, Instinctive Response Training, IRT, Marc MacYoung, MMA, MUAY THAI, Personal Protection, Rory Miller, Self Defense. Bookmark the permalink.